Price: $185.00 - FREE TO MEMBERS! Lost productivity can be the result of delays, acceleration or changes to the work. As with any claim for increased cost, proof of causation and proof of costs are both necessary. This report examines both. 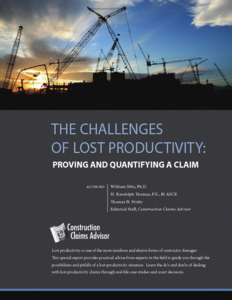 Experts in the field of construction productivity and claims provide a comprehensive view of the subject, discussing quantitative and qualitative aspects of proof and causations, methods of calculating costs with useful tips and techniques to minimize productivity losses and to assure maximum recovery in the event of a claims situation. Select court and board decisions provide a realistic backdrop of how the industry has arrived at the accepted approaches commonly in use today. 3. CONSTRUCTION LEARNING CURVES: FACTUAL OR IMAGINED? PDF File; A WPL Publishing Co., Inc. publication.